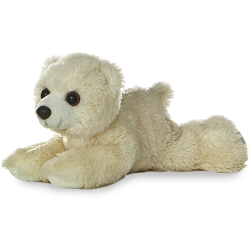 Arctic is an adorable little polar bear stuffed animal from the Aurora World Mini Flopsies collection. And it will be love at first hug when you feel the soft cream fur and look into the sweet brown eyes of this plush polar bear's smiling face. 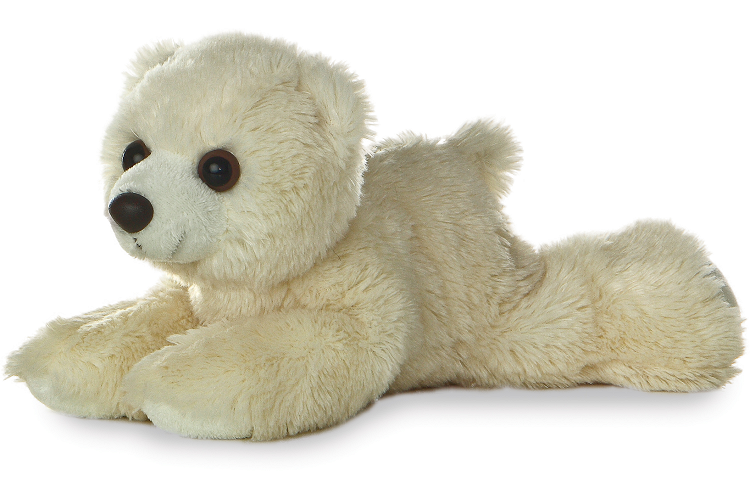 Oh-so-cuddly with an understuffed body, Arctic Polar Bear is the perfect size for hours of imaginative fun and take-along adventure. Fun Facts about Polar Bears: Polar Bears live in the icy Arctic region, one of the planet's coldest environments. Polar Bears became an endangered species in 2008 because their habitat is shrinking due to the ice floes melting. Polar Bears have black skin and a think layer of fat (up to 4 inches thick) under the skin that insulates them from the cold. Polar Bears are up to 10 feet long and weigh about 1,600 pounds. As you would expect, males are larger than females. Females den by digging into deep snow drifts which provide protection and insulation from the Arctic elements.